Yes I noticed this a long time ago that it goes from http to https and vice versa. I did ask Viki about it because I was concerned but I don't remember what their answer was. Honestly I don't like it that not everything is https in this time of day and with all the cybercrime. But over here the local governments or hospitals sometimes don't have the latest security updates installed so and their certificates in check and updated. @hana_860 told me about this, or else I wouldn't have noticed it. And you're right. I'm also experiencing the same issue. I've uninstalled and re-installed my internet browser and the issue still persists. I hope Viki can give us an answer about this. Thanks! This is going on since I noticed it last week but I thought it was something temporary. Thanks everyone for responding and camille, you too for helping me feel more relaxed now.I really thought it was someone trying to get my adress bc several times i was send PM with weird messages but thankfully it stopped. Again sorry about the misunderstanding. Websites appear as "Not Secure" by default, on many browsers, when the connection is not encrypted (https). Should it be? Yes, it's 2018. Does it matter? Not really. It's not like you type national secrets in the subtitle editor. Don't loose sleep over it. The sender (Viki Community) has a staff badge in their profile so it looks legit. We got a similar one last year. That PM from Viki is 100% legit, they send it every year around this time. "Should it be? Yes, it's 2018"- you got 100 points on that one;). "Does it matter? Not really" - is arguable, though. It's true, one doesn't type high security info in the subtitle editor. However, to get into the editor, you have to log in, and by logging in, you're giving your e-mail and use a password, or connect through your Google account, or through FB. All ways of connecting to Viki involve some type of personal info shared with a third party, so I wouldn't exactly say "not really". To my support, my cellphone won't even let me access the subtitle editor, because of the risk I'm supposed to take by doing that. Not that I subtitle from my phone, but I was curious if the security warning disappears when logging in from another device. Now, do I think someone will hack my account? Most likely, not. Do I believe it's important for Viki to update it's security certificate? Totally. Unless they plan a DramaFever move, aka a sudden closure, and don't bother with such trivial stuff anymore. Right. Is this a certificate on something that needs renewal or what. I have also heard that some folks are having weird hijacking popup windows come up when working in the tools now too. Agreed that it is recent - after the last server issues, that's when I started to see it personally. Kept forgetting to write to someone about it, thank you for doing this. Yes I notice this problem today, Should I worry ? Yes and No. I have one of the best protection you can get it is called Malwarebytes Premium, nothing can get through it, it will stop it dead in it's track. I have had it for years. Also if you have Google chrome as a browser it have it's own protection. Wow I didn't think it would go that far but I'm glad you mentioned this here so maybe that must be the reason I was send a message to change my passwords but I have no FB page but I do sign in through my goggle account since I was never able to access viki any other way. "Does it matter? Not really" - is arguable, though. It's true, one doesn't type high security info in the subtitle editor. However, to get into the editor, you have to log in, and by logging in, you're giving your e-mail and use a password, or connect through your Google account, or through FB. 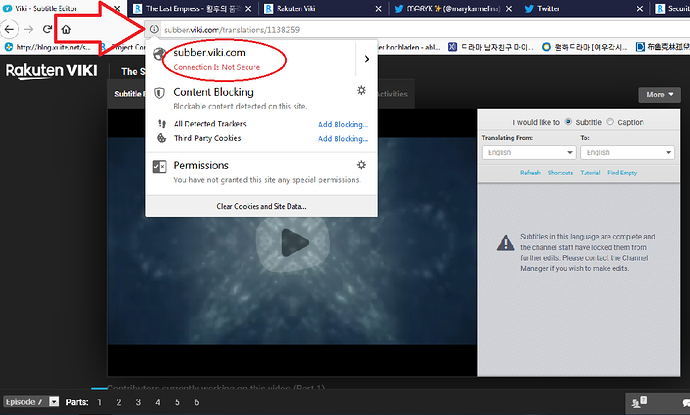 All ways of connecting to Viki involve some type of personal info shared with a third party, so I wouldn't exactly say "not really". Thank you MaryK for the images so that Viki Community and Viki Support will be aware. I emailed Viki Community Support and they instructed me to send them the image, but I was having a problem doing it. So, thank you for doing it here. Thank you Denisse for raising this issue. This security issue is happening in USA, too. I emailed Viki Community Support and they requested an image of the problem. I am glad MaryK posted it here. I hope to hear from Viki Community Support soon. The reason you were seeing "not secure" when you entered the subtitling tools was because it was still under HTTP and had yet to transitioned to HTTPS. We've just moved it to HTTPS and you should not be seeing it say "not secure" anymore. in most of the dramas i sub it stand in red NICHT SICHER (Not Secure). @kristie Yes, mine is secure now. Do I need to log out and log in to see the secure link? The discussions forum appears secure.